CTA can make a great difference to your sales funnel success and conversion rate ultimately. These small, provoking messages of different shapes, senses and sizes, are the hooks with baits that either make people get through the stages of your sales funnel to the very bottom, or not. However, while the look of CTAs is discussed and argued (so scrupulously it gets irritating), their relevance to the point your audience is at in the buyer’s journey is being missed out. In other words, online store owners screw up with timing. If your CTA doesn’t match customer’s intent at the moment, they won’t click it -- and once they fall out the sales funnel, there’s little chance to bring them back. Hopefully, such scenario is easily avoidable: you simply need to provide relative CTAs at each of the sales funnel stages, that are awareness, evaluation and purchase. But before we get down to these three, let’s start with the basics of CTA itself. What Builds an Effective Call to Action? CTA is an instruction aimed at causing an immediate response of your audience. That action can be a lot of things: request to download a whitepaper, opt-in an email list, register for an event, purchase a product, share, comment, etc. – The Design. To make people click them, CTA buttons need to be distinctive, clearly visible and displayed in high contrast with everything else on the page. – The Message. Writing just “Click”, “Download” or “Submit” is not the best you can come up with. Your copy should use power words and actionable verbs, personal prepositions (your, you, my) and, importantly, include a value proposition. Users would most likely click anything if they know what’s the benefit of doing so: “Download FREE e-book” sounds better than a vague “Click here”. – The Placement. Finally, CTA needs to be relevant to the user’s intent and content it’s placed in. CTA to an About Us page won’t be as effective in gathering leads as a CTA to a dedicated landing, right? Equally, the bottom of the funnel CTA is rarely the best idea in top of the funnel content. Now, when we have a clear image of a successful call to action in general, let’s get back to sales funnel stages we’ve talked about earlier. Top of the funnel (Awareness) – at this point user discovers your store in that or another way, usually through content or advertising. Middle of the funnel (Evaluation) – here, users already know what your store or service is about, and looking for available options for their needs. Bottom of the funnel (Purchase) – the final sales funnel phase at which users are ready to perform a purchase and just need a little more “pressure” to finishing their buyer’s journey successfully. Above, is an “ideal” example of the sales funnel. In online retail, funnels are often much more shorter with very vague borders between the stages. For better convenience, let’s call them Short Sales Funnel (typical in eCommerce and B2C) and Long Sales Funnel (typical in B2B, SaaS) to avoid confusion. At an awareness stage, you’re not to promote or push any specific service or products. Most likely, users are looking for information and knowledge (specific or not), and that’s what you should provide them with. Typically, blog posts, infographics, whitepapers and all types of content is the medium through which those users found you. In B2C eCommerce, however, CTAs might be slightly different, since sales funnel is often shorter. After reading educational material, users are interested in purchasing a product. In this case, CTAs to visit product section, or “Purchase now with 5% discount” might be reasonable. Also know as an evaluation stage, middle of the sales funnel is a transitional point from “discovery” to “purchase”. This phase is often a part of so-called Long Sales Funnel typical for B2B. Customers in online retail tend to skip the evaluation phase or, rather to say, blend it together with the awareness stage being driven by a pragmatic desire of saving time and effort. 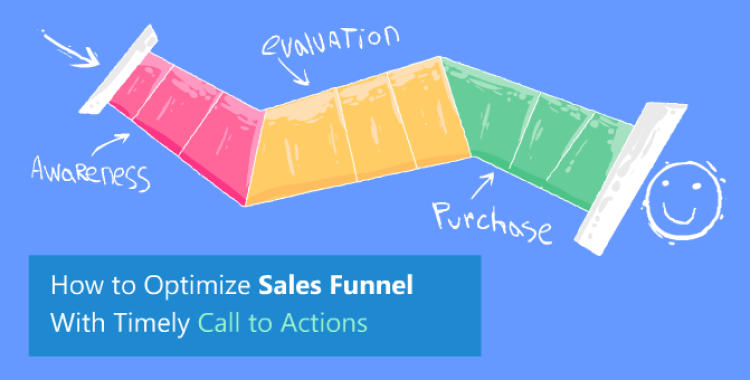 Sales funnel optimization depends on a lot of things, and effective, timely call to actions is an important part of it. Setup follow-up content and slowly move customers from the very top to the bottom of the funnel. How do you optimize your sales funnel? How perfect CTA should look like? Share your thoughts in the comment section below.